The murder of Ottawa rookie Constable David Kirkwood on July 11, 1977, launched a response that has become the nationally recognized ceremony honouring police and peace officers killed in the line of duty. 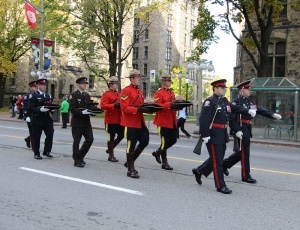 Following Kirkwood’s senseless death, Ottawa police officers vowed to keep his memory alive and to ensure the magnitude of his sacrifice, and that of others like him, would never be forgotten by Canadians. Accordingly, on Sunday, September 28, 1978, a special service and tribute was held. The site selected was Parliament Hill, the place where laws are made that directly impact on police officer safety and ultimately, the quality of life for all. Following the first ceremony, a number of features have become traditions and other modifications have been made to the service. On Monday, March 1, 2010, Constable Artem James Ochakovsky, age 36 of the Peel Regional Police Service, was fatally injured in a motor vehicle collision while responding to a call for service. He succumbed to his injuries on Tuesday, March 2.